Here we list the answers to some of our most frequently asked questions. If there’s something you need to know that isn’t covered here, then please do get in touch and we’ll be delighted to help. Can my dog(s) come and stay too? At RiverBeds, we love your furry friends and they’re very welcome to join you on your stay with. We do ask for a £10 contribution to cleaning costs, per stay. There is one wee lodge that is kept pet free, for guests who may have an allergy. Please remember that the wee lodges are not, er . . . big. You alongside two Deer Hunters might find it tight. The wee lodges enjoy underfloor heating. Your dog will not! We suggest that guests with dogs turn off the underfloor heating and use the electric plinth heater instead. When is Check-out/ Check in? The postcode PH49 4JX is a wide area, and you will NOT find us easily and quickly by using only this! The web page with guidance instructions is here, or alternatively please download our handy pdf of getting to RiverBeds here. How do I access mu lodge on arrival? Please download our handy pdf of getting to RiverBeds and finding your Lodge. It’s here. Each lodge has a wee galley. Not intended for preparing meals, more for heating up food and making snacks. There’s a microwave, fridge, kettle, toaster. For those staying 2+ nights, enjoy the daily housekeeping service. Your wee lodge is freshened each day, with new supplies as needed. If you require anything else at any time, then please just contact us in the Club House. Where is good for dining out? Eating is another great adventure! There are many options and we list these here. Whilst some guests choose to stay around their lodge and enjoy a meal on their river-bank terrace or the table in their lodge, others enjoy the good selection of bars, inns and restaurants within a 5 mile radius. Our own cafe is located very close by, and is open during the day with lovely homemade fayre, excellent coffee and fine home baking. 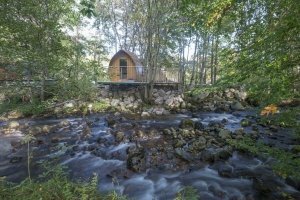 RiverBeds provide wonderous wee lodges on The Dragon’s Tooth estate. This special 36 acre site is nestled at the foot of the mighty “thunderbolt mountains”, with the dramatic peak known as “Dragon’s Tooth” forming part of the ridge. The Dragon’s Tooth Golf Course forms part of the estate which leads down to the lochside at Loch Linnhe. There are easy walks just from the doorstep, as well as some fascinating historic sites on the estate, or near it. Jump into your car for a few minutes, and there are other superb walks to discover nearby. From 5 minute strolls to 3 hours walks – there are some brilliant experiences just on the doorstep. On the flat or up into the mountain – its all here! Take a look at our easy guide. Some simply love the romance of the place and spend happy times journeying between hot tub and bed. Here, you are in the heart of the Outdoor Capital of the UK and there is so much on offer. From Ben Nevis, to the Steam Train to Mallaig, to magical Mull. All about us is dramatic Glencoe, and there is so much to see and do in the area. Just vist our local marketing group website for oodles of info. Our own doorstop favourites are here. And it’s so easy to forget the best things – easy walksright from outside your lodge. The estate is owned and operated by Ossian Developments Limited, a Scottish Company registered in Ballachulish – it’s directed by locals Morag and Laurence Young, with their sons Callum and James very much involved on a day-to-day basis. Do contact the family at any time : Laurence’s mobile is 07860 558005. Special Offers are available, especially out of the main season, and for Sunday to Wednesday arrivals. Yes you most certainly can, and you can purchase them easily online here. Are you open in all seasons? Yes, we’re open (and busy!) all year round. In fact, many say that Winter is the best time to visit RiverBeds with snow-dusted hills and crisp, clear scenery. Nothing like a cosy lodge and bubbling hot tub when it’s cold outside! Roads do tend to stay open even in snowy conditions, but we recommend checking the Traffic Scotland and Met Office Weather websites before departing just to be sure. Bookings can be changed or cancelled up to 60 days before your arrival date for a simple £30 processing fee. No changes can be made within 60 days of arrival, so for this reason we recommend that all guests carry travel insurance to protect against personal emergencies outside our control. We offer a “peace of mind” cancellation option for bookings via our own web site (presented during the “shopping basket process). Can I stay for 7 nights or more? Or rather, what do I get in my wee lodge. There’s a pretty full list towards the bottom of the page here. You can find our best prices and book online on our booking page.